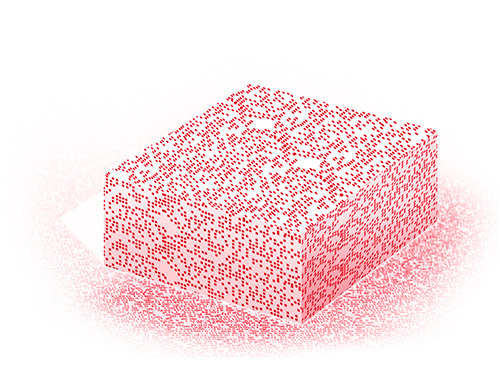 Random pattern projector with >33,000 dots for 3-D stereo image processing. The clear allocation of the pixels in both camera images in an image comparison is a prerequisite for 3-D stereo image processing; however, this is only possible on clearly textured surfaces. Monochrome surfaces with little or repetitive texture cannot be clearly allocated. Markers or random patterns on the surface to be measured help. The MVstereo laser random pattern generator projects a random dot matrix in which each dot is allocated a certain position. The laser is available with 660 nm or 830 nm. Both versions are implemented in an eyesafe manner (laser classes 1 and 1M).